Consider this a sequel in the “let them eat Vista” series of posts [1, 2, 3, 4, 5, 6, 7, 8. 9]. We strive to better understand the black art of using free (gratis) software to capture the minds and the personal data of young individuals in less privileged parts of the world or those who do not know better (about cross-platform development). As you have probably read by now (because it is widely covered in a lot of media), Microsoft is now reaching out to young people, whom the company hopes to use in order to back its agenda of (re)capturing the Web (Novell helps Microsoft here). The press release is very coy and subtle. This has an effect on media coverage as well. Although Adobe is mentioned as a party yet to be affected, the technology behind this move gets almost concealed. “If Microsoft cannot continue its ownership of many desktops (devices aside), it wishes to leave a proprietary ocean of data spread all over the Web.”If Microsoft cannot continue its ownership of many desktops (devices aside), it wishes to leave a proprietary ocean of data spread all over the Web. It would be hard to clean up such a mess and it creates a great deal of dependency on Microsoft (for access to vital information). Think about tomorrow’s generation of Linux-based mobile devices and Microsoft ambitions of turning the Net into .NET, most notably using Silverlight. Where does that position Linux? What about Moonlight? And why is a Microsoft ISV trying to shove the patent-encumbered Mono into Linux phones? These are urgent questions. The quicker they are raised, answered and brought to people’s attention, the quicker they can be addressed. This brings us back to the big news from yesterday. Microsoft spreads its seemingly-innocent love with seemingly-free tools, from which Microsoft benefits a lot. Using a broadband connection, students can download Visual Studio, Microsoft’s main development tools used by professional developers, and Expression Studio, design software that rivals Adobe Systems Inc’s Creative Suite offering. Giving away Microsoft software also helps to ensure the next generation of code writers is well-versed in the Redmond, Wash., company’s technology…. Because they are minors and can’t sign license agreements, high school students will have access to the tools only through their teachers. Microsoft also has a lot to gain here because these young people, unaware of exactly what their use of these tools means to the market, might develop Web sites that work only in a couple of proprietary operating systems. In a sense, they ‘spread the plague’. They ‘proprietarise’ the World Wide Web — something which Tim Berners-Lee last warned about just months ago. Would you believe… that Microsoft has dropped down to #86 within the Fortune Best Places to Work survey? That’s down from #50 in 2007 and #42 in 2006. Like a rock. In a bad way. And who is #1 for two years in a row? Grab that chair and give it a big effen toss in the air to Google! Toot! They get bigger and they’re still #1. DreamSpark would have been cool…20 years ago. Today it’s an admission, as Glyn Moody writes, in “the plainest possible terms that its business model has failed.” Sorry. Maybe you’ll catch up next century. These days, dear Mr. Gates, you must give away the core. No one is interested in mere complements anymore. Those are the tools necessary to drive revenue around the core being open sourced. Look around. Everyone (Google, Yahoo, MySQL, Red Hat, etc.) is doing it. There are some more links of this kind in this older post. Microsoft has been losing developers for several consecutive years, at least based on Evans Data’s surveys. Other surveys appear to concur, so the results are consistent and difficult for Microsoft to dismiss. “The fact that Microsoft is targeting young and innocent minds is eerily reminiscent of the fact that Novell brought Mono to teenagers.”The fact that Microsoft is targeting young and innocent minds is eerily reminiscent of the fact that Novell brought Mono to teenagers. Yes, a company that takes pride in ‘open source’ is actually choosing Microsoft technologies for its curriculum targeted at young minds. That’s Novell for you. 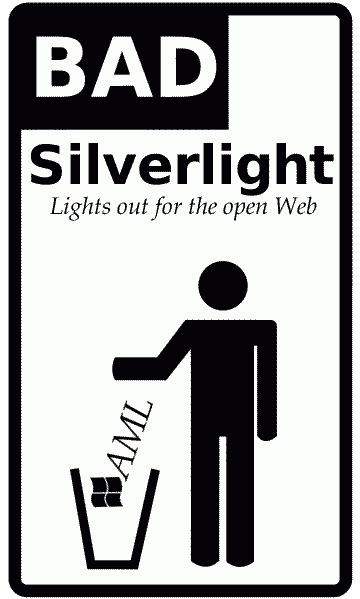 Silverlight and OOXML are among Microsoft’s last attempts to survive what it called “a sea of change” (a phrase used by Bill Gates, or maybe that was Jim Allchin). They must both be intercepted. The quicker, the better. Sadly, Novell is lobbying for both Silverlight and OOXML. Novell is enslaved by its contract which had it receive a cash infusion. Silverlight and OOXML are a pair to shoot down. So are Microsoft and Novell, in order to restore competition based on standards in this market (as opposed to software patents and secret deals).